1. Ama Ata Aidoo’s (Ghana) The Dilemma of a Ghost and Anowa (both are short, and included in the same Longman African Writers book) were required reading my freshman year of college. I then had the opportunity to hear her speak later on in undergrad, where I learned that she’s so much more than an novelist. Former Ghanaian Minister of Education, she was also the first published African woman playwright (some people really just collect accolades effortlessly). Fun fact: there’s a film about her called The Art of Ama Ata Aidoo that I haven’t had the chance to see. Over the course of a year the film follows Aidoo as she returns home to her ancestral village in the Central Region of Ghana, launches her latest collection of short stories in Accra, and travels to the University of California, Santa Barbara to attend the premier of her seminal play about the slave trade, Anowa. 2. 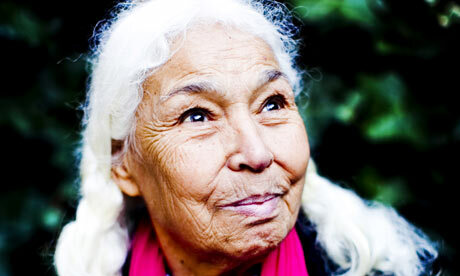 Nawal el Saadawi (Egypt) was a professor at my undergraduate institution when I first started in 2008. I was unable to take her class, but her book Woman at Point Zero was required reading in my introductory philosophy course. I’d also recommend The Hidden Face of Eve: Women in the Arab World. If nothing else, I recommend reading about her life— from female circumcision to looming child marriage, her story incredibly painful at times, but obviously informs her radical feminist beliefs. 3. Mariama Bâ (Senegal) writes in French, so try reading her words in their original form if you have the ability to do so. So Long a Letter is a serious contender for most powerful book on this list. Written from the perspective of Ramatoulaye, this semi-autobiographical book is an extended letter to her friend Aissatou. The letter details her marital challenges, including her husband’s betrayal by taking a second wife. So Long a Letter is heart wrenching, and even angering at times, but summarizes parts of Mariama Ba’s experiences as an educated Muslim woman. 4. Tsitsi Dangarembga (Zimbabwe) authored Nervous Conditions, a coming of age story about a young woman hoping for education in post-colonial Rhodesia (now Zimbabwe). The title is a reference to the Jean-Paul Sartre’s introduction to The Wretched of the Earth, which we talked about here. I PROMISE you: if you like Chimamanda, you’ll like Tsitsi. The cultural references and contexts differ, but Nervous Conditions will satisfy your need if you want to read the voice of a strong and smart female African protagonist. Ultimately, the Afropolitan must form an identity along at least three dimensions: national, racial, cultural – with subtle tensions in between. While our parents can claim one country as home, we must define our relationship to the places we live; how British or American we are (or act) is in part a matter of affect. Often unconsciously, and over time, we choose which bits of a national identity (from passport to pronunciation) we internalize as central to our personalities. So, too, the way we see our race – whether black or biracial or none of the above – is a question of politics, rather than pigment; not all of us claim to be black. Often this relates to the way we were raised, whether proximate to other brown people (e.g. black Americans) or removed. Finally, how we conceive of race will accord with where we locate ourselves in the history that produced ‘blackness’ and the political processes that continue to shape it. 6. Assia Djebar (Algeria) passed earlier this year, leaving behind a breadth of literature. Unlike most of the other authors on this list, she’s not Sub-Saharan African. Her writing details women’s experience in Algeria, specifically the growth of Algerian feminism around the Algerian war of independence. Check out Fantasia: An Algerian Cavalcade, or Algerian White (which is on my list), but you probably can’t go wrong with any of her works. 7. Honorable Mention: Edwidge Danticat is Haitian, not African, but I still thought she was a welcome addition to this list. Danticat is a formidable storyteller, specifically where it pertains to the African diaspora. While the Caribbean features heavily in her writing, you’ll find that the voice is not unlike some of the African authors I’ve already listed. I specifically recommend Krik!Krak! and The Farming of Bones; the latter was my required reading in an undergraduate Caribbean history course (thanks, Dr. KPL). I will likely make a West Indian authors list at some point, so be prepared to see her name pop up again! Poll: What’s the best book you read in college? I look forward to reading more of your blog! Just wanted to let you know that Chimamanda’s name is spelled incorrectly in this post’s title -oops! I'm just a 20-something with a love for multicultural literature and hot tea. Follow my blog for book reviews, critical analysis, and deeply steeped tea!